There are different areas in the house where the area rugs can be of good use. They can be used in the living room on the different sitting areas, they can fill in the blank tiled floors on the kitchen, or separate the dining area from the living area if ever they share a common room. Area rugs help divide the house into sections creating distinct spaces for the different areas with different functions. To make it simple, area rugs help us identify the different areas of the house. It is the function of area rugs to clearly show the furniture grouped together at a certain area and where other furniture should not be included. You can also use area rugs as smart solutions to floor problems that cannot be repaired immediately. Cracked tiles or stained wooden floors can disappear instantly and be replaced with an eye catching, attractive area rug. This is great if you’re having guests over and you won’t be able to repair the damages on your floor. But don’t get too excited to put on area rugs on your floor areas. 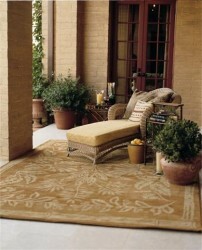 There are certain things you need to know to make the area rugs work well with the rest of the elements in your home. First of all, use area rugs only on appropriate areas. A two chair conversation area by the window can easily identify the space it is trying to portray, you don’t have to put a rug on every area you create throughout the house. Try putting these area rugs on the most important area of the room. In the living room for example, put the area rug on the main sitting area where the sofas and center tables come together. Minor areas like small conversation areas don’t need the area rugs. Too much of the area rugs can make the room look too busy and crowded. It’s always good to have the illusion of space with only a few things in the room. It’s also important to choose the right area rug for the whole look and concept to come together. Amazon.com made it easy for their customers to browse through the area rugs they have available. The area rugs have been categorized by size, shapes and materials. You can easily find the right area rug you need for the different areas of your home just by visiting the categories that you find to be most interesting. Try to base the rug on the color of your floor and the type of furniture you have. Aim for a harmonious look among the different elements of your home with the area rug you want. An area rug can really be helpful for your home as long as you choose the right ones and place them appropriately on the different needed areas of your home. Make your search and choices fast and easy by browsing through the area rugs available on amazon.com. Save space, define areas, and keep your floor stylish with these area rugs.